LinkedIn is a powerhouse to build and grow a professional network that can accelerate and scale up your business growth. Anyone seems to be an expert, but a few have told you the truth about the professional social network that can make or break a company’s business model. I used LinkedIn in the last years for PR, direct sales, prospecting, networking, and personal branding. In this guide, I want to show you everything I’ve learned. I’m not going to keep secrets or tell you the obvious (like many others do). I’ll let you know what real sales and marketing professionals do on LinkedIn and how they use it to their advantage to bring value back to their business. From prospecting to automation. No secret sauce, but just a lot of tinkering. The truth about LinkedIn Automation and how to do it right! Do you need LinkedIn automation at all? When does it make sense to use LinkedIn automation? Testing what works and what doesn’t, fast! In this article, I want to show how I pushed LinkedIn automation tools to the limit to test until which extent you could use them “safely” and get the most out of them. A little caveat: the account suspension was the result of a tool I’ve used that is not in the article. The tool that I recommend later in the article also suggests you best practices. If you don’t follow them and your account gets blocked this is your responsibility! That is also why I decided to run a few tests and see the LinkedIn free tools for automation work. LinkedIn is a goldmine for businesspeople. With over 467 million profiles, it is probably the most significant professional database on the internet. Many believe that only by using those tools would get your account permanently suspended. I didn’t think that myth. However, until I didn’t test that I couldn’t know for sure; in fact, I safely used LinkedIn automation tools for more than a month, and nothing happened. Then I decided to push it to the limit (we’re going to see in a bit what those limits are) to see to which extent you can use those tools for your business workflow. There are a few LinkedIn tools that allow you to automate everything. From adding new contacts to set up a flow of follow up messages. Although very powerful I don’t suggest you use that because it barely works and the risk to compromise a relationship might be too high. So when does it make sense to use it? In the prospecting phase in a traditional sales funnel you might need a few hundred leads that can help you grow your business. You can argue that LinkedIn is for relationships. In fact, it is. But how do you deal with a boss that asks you to produce a constant flux of prospects? Let’s not fool us. If you work in sales besides results, you’re asked to do a day to day or weekly reporting. We know that is useless. In fact, at the end of the day what matters is conversion and how many real relationships you’ve built! Many argue that optimizing for the algorithm it doesn’t make sense. All you need is to post great content. That is BS! In fact, many times I posted things which I believed were way more interesting than many others I posted in the past, yet for some reason the algorithm made it go through to just a few dozens of people. For others posts that are qualitatively lower, the opposite happens. Since there is no way to know exactly how the algorithm works, rather than waiting for that to show people your content, you can automate the reach out so you make sure each time people in your network you know might be interested will see that. Today like in the past business conversations are critical because they might turn into business opportunities. Leave a discussion to an algorithm might be too risky. Especially if you run a business based on complex sales. In fact, any algorithm or automation isn’t smart enough yet to get all the subtleties of a conversation. Even though chatbots are moving quickly and they might be good at generating those conversations. If you want to get to the next stage, you have to make sure you can emotionally connect with that person. People want to do business with people. If they perceive you’re a bot, automatically the conversation gets devalued. So the risk of losing a business opportunity is too high. However, it is true that automation can work to trigger those conversations, which leads us to the next point. LinkedIn automation can be useful also to speed up the process of testing several messages copies fast. In fact, imagine you have a copy vs. another copy. How do you know which works best? You can send one by one to a set of people, have slight variations and see what converts best. However, this is true only in part. From my experience with outreach what works best is personalization. First, because if you’re reaching someone out that person doesn’t care about you or your business but only what you can offer to her/him. Thus, if you didn’t take the time to research that person profile and study its business the message will have a meager conversion rate. Also, if you are about to reach out an online publisher about an SEO service, there is no doubt that organic traffic growth will be a critical hook. Second, you have to make sure your message won’t sound automated. In fact, as soon as it does, the person, on the other hand, won’t bother caring about your message. This is useful also as a prospecting tool. In fact, when you visit someone’s else profile, that person will notice. Thus, this should improve your profile visibility. It is also useful to make that person comfortable with you before you reach out. As repetition is the mother of sales. If you allow a person to see you a few times before you reach out, then it’s almost like you already know each other. Therefore, that will improve your chances of generating a business conversation, while it will decrease your likelihood of getting rejected. Many believe that all you need to do is to build a so-called pull strategy and hundreds of people will contact you, just because you’ve become a celebrity, and you won’t bother anymore in reaching out to anyone. Even if you might become one day a so-called “top influencer” there will be many times when without reaching out you won’t be able to talk to the right people. Certain activities are geared for the pull strategy, but that will work over time. In the meanwhile, you have to become quite good at reaching out. What activities will gear you toward the pull? Automation is powerful but also dangerous if it goes out of hand. That is why you might want to start small. Thus, instead of automating right away for hundreds of contacts, begin with 10-20 touches. If your screw up rate is 10%, you might be wrong in contacting 1-2 persons. So the damage is limited and the potential high. That small automation will also allow you to see what works and what doesn’t. Do you know who your ideal customer is? No? Then think about it deeply before moving forward. In other words, before starting this process of automation, you want to make sure you know which set of people you can create value with your offer. If not sure yet, do your homework. Look at your customer’s profiles, conversations and past deals you closed. Once you have that clear in mind, put down a list of keywords that represent your ideal customer. The process won’t need to be complicated and require a lot of time. Just start with a simple test. Trial and error is the key here. Many will pretend not to use automation tools on LinkedIn for several reasons. However, it is undeniable to automation tools if used correctly can help you out in growing your business. I am not crazy about automating my LinkedIn activity, but this is because most of what I do now is a complex sale that requires since the start a more sophisticated interaction with customizations that the automation tool can’t do (For instance, I might need to send a personalized report for a potential client). However, for those that don’t get that deal with a more streamlined sales process those tools might be beneficial. In this article, we saw why when, and how to use automation. 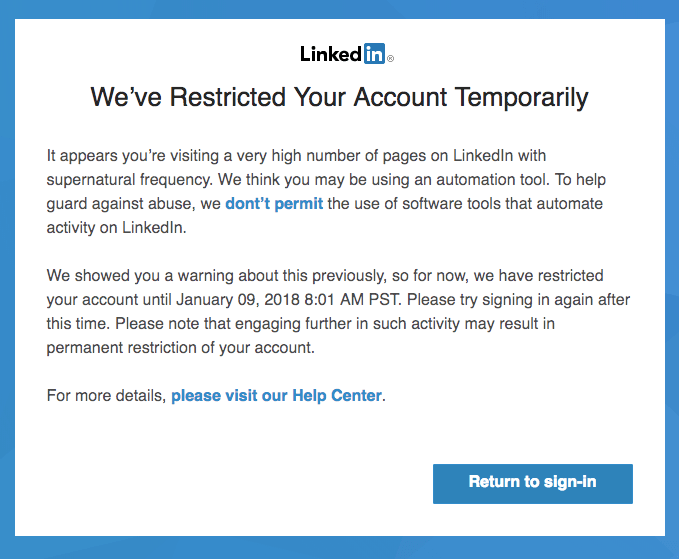 I hope my experiment and the fact that I was kicked off by LinkedIn for a few hours will give you the awareness to use any LinkedIn automation tool with the proper caution. The most important part is not to push the algorithm too much and just run minimal automation at the time.